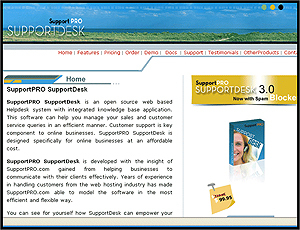 SupportPRO SupportDesk 3.0 is a customizable web based helpdesk for complete customer support management. This open source software and Supports unlimited users, staff, departments, companies. Main features include email piping,POP3/SMTP support, integrated knowledge base, multiple themes, spam blocker, admin reports, reply templates etc.. This installation is for 2 month FREE trial. It can be extended to regular license by purchasing a paid license and without impacting existing data.